LA JOLLA, CA—Compare any two people’s DNA and you will find millions of points where their genetic codes differ. Now, scientists at La Jolla Institute for Immunology (LJI) are sharing a trove of data that will be critical for deciphering how this natural genetic variation shapes the immune system’s ability to protect our health. For more than four years, a team of LJI scientists led by Associate Professor Pandurangan Vijayanand, M.D., Ph.D., has been undertaking a massive immunoprofiling effort, detailing how variations in DNA sequence impact gene activity in different types of immune cells. The team is sharing their findings through a new database, DICE (Database of Immune Cell Expression, Expression of quantitative trait loci and Epigenomics), which allows researchers worldwide to easily explore the data as it relates to the genes, cell types, or diseases that interest them. Genome studies have linked thousands of variations in the genetic code to human disease. But such associations don’t readily reveal how these variations impact cellular function, or suggest how scientists might intervene to mitigate risk or treat disease. Many of these variations occur in the largely uncharted genomic DNA sequence between genes, where they may instruct cells how and when to use certain genes—but which genes they actually regulate remains a mystery. What’s more, while every cell in a person’s body contains the same genetic code, different cells use that information differently, switching on or off genes according to the cell’s unique role in the body. That means that to interpret the impact of genetic variation on our cells, researchers need not just a map, but an atlas. When it comes to the immune system, DICE is that atlas. To create the atlas, Vijayanand’s team began by isolating different types of immune cells from donors’ blood samples. Then they assessed the donor-specific genetic variations and used RNA sequencing to determine, for every cell type, the activity level of every gene. Thirteen types of immune cells were included in the analysis. For two of these, in addition to assessing gene activity in the cells in their resting, inactive state, the team stimulated the cells similar to the stimulus they would receive when recognizing a pathogen or malignant cancer cell, and then profiled gene activity in this activated state as well. Ultimately, the team sequenced and analyzed more than 1,500 samples. The result, says LJI Professor Bjoern Peters, Ph.D., who led the team’s computational analysis as well as development of the DICE database, was a massive amount of data. Sifting through that data, the team has already uncovered some surprising features of the immune system. For example, the team discovered that gene activity in specific types of immune cells differs dramatically between males and females. Also, they found that often a genetic variant affects the expression of a nearby gene only in one cell type; therefore the unique differences discovered would not have been found using whole blood. The team has also begun following up on some intriguing leads, investigating the roles of certain genes their data suggest may be relevant to disease. Indeed, members of the research community have begun to explore DICE, homing in on the wealth of new information about cells and genes that they study in their own labs. And when future studies link a specific genetic variant to disease, researchers can turn to DICE to learn which genes are affected by the variant and in which immune cells, says LJI President and Chief Scientific Officer Mitchell Kronenberg, a coauthor on the Cell publication. That could help researchers narrow their focus to genes and cells that contribute to the disease. While DICE is already a valuable resource, the LJI team acknowledges the atlas is not complete. 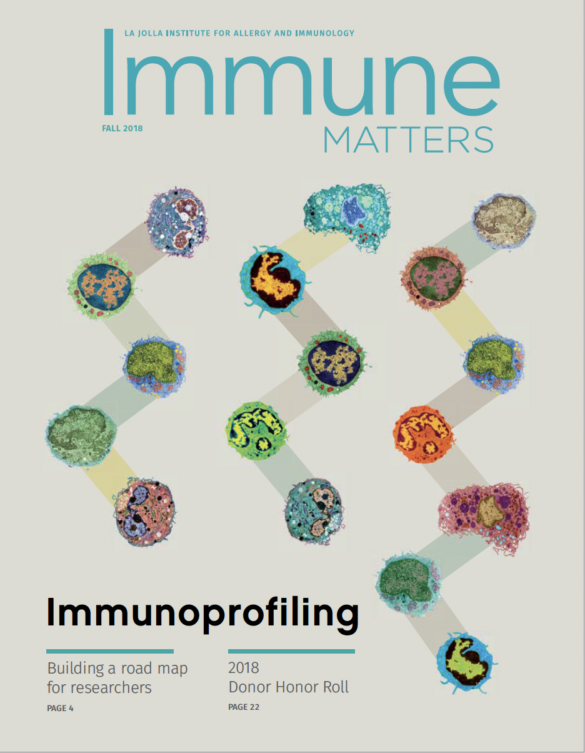 Vijayanand and colleagues are continuing their immunoprofiling efforts, adding more activated cell types to the database as well as profiles of rarer immune cell types. They also plan to expand each cell’s profile to include new types of information, such as epigenetic maps, which will aid to pinpoint the positions of the gene-regulating variations. This work was funded by NIH grants R24 AI108564, S10RR027366 and S10OD016262 as well as the William K. Bowes Jr Foundation.